Gaturro and Ramiro lose the ball they are playing with. Ramiro helps Gaturro with a trick to woo Agatha. Gaturro and Gaturrín are playing with a bow and arrow. There's a strange and nauseating smell in the studio and Agatha blames it on Gaturro. Gaturro attempts everything in his power to get Agatha's attention, buy she doesn't seem to care. A new character arrives to the studio, the nice bunny Dienturro who hands out colored eggs for everyone. Gaturro and his friends dress up to watch a horror movie. Gaturro runs urgently to the toilet but Camila arrives before him and occupies it. It's Sunday morning and all the characters are enjoying their day but Gaturro doesn't feel that well. Gaturro and Gaturrín go searching for the Christmas tree and its presents! Gaturro is very depressed because he can't go forward with Agatha and goes to Canturro's Bar in search of an ear and some advice. Ramiro is helping Gaturro with his women problems going into his past and his relationship with his mother, Agatha and Gatulove. Gaturro comes out of the comic strip and slips on a suspicious pool of water. Gaturro is crying over Agatha, so Ramiro tries to cheer him up showing him that he is a very famous cat. Gaturro and Emilio are playing checkers when out of nowhere a cat from the future materializes in front of them asking for Gaturro. Gaturro gets a double of himself to take care of the tedious task and impress Agatha. Ramiro will Help Gaturro win Agatha over in a virtual game full of adventures where he'll have top robe his courage to gain her heart. Ramiro helps Gaturro solve his problems with women through a very questionable dream therapy method that always ends up with dreams of his beloved. 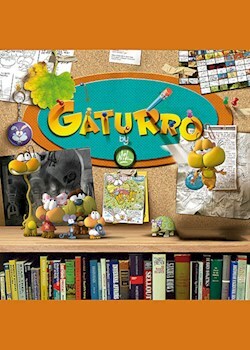 A computer virus threatens the Gaturro´s computer and to be able to fight it off Ramiro sends Gaturro to the virtual world in search of a solution. Gaturro will investigate the mysterious death of Emilio, suspecting from each one of his friends until proven otherwise.